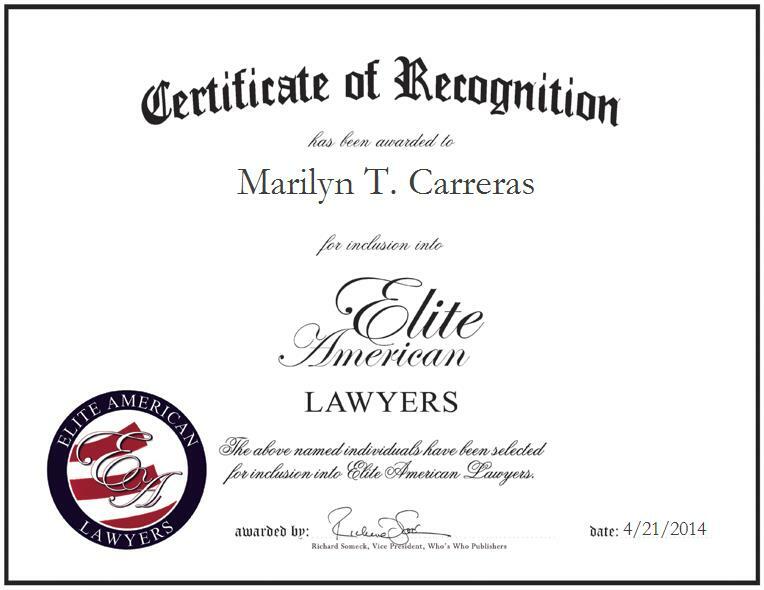 WINDHAM, NY, April 21, 2014, Marilyn T. Carreras, Attorney at the Law Office of Marilyn T. Carreras, has been recognized by Elite American Lawyers for dedication, achievements and leadership in legal services. Ms. Carreras’s passion was to assist others in finding fair solutions to situations in life, therefore decided to pursue a career in the legal field. She has been refining her skills in the industry for more than three decades and established her firm in 1987. Ms. Carreras practices in various areas of law, including general practice and trials, real estate, divorce and custody, probate and wills, traffic, contracts, construction, mortgage, and elder. Ms. Carreras gained extensive legal experience throughout her career, serving in a number of positions and completing internships that exposed her to the varied areas of law. She interned at the Office of the U.S. Attorney for the Southern District of New York, the Manhattan District Attorney’s Office, and the Westchester County District Attorney’s Office while attending law school. During these internships, Ms. Carreras assisted in legal areas such as white collar crimes and fraud prosecutions. Ms. Carreras also practiced law in New York City and Suffolk County, N.Y., and was one of the attorneys to undertake a three-year endeavor to revise the New York rules of professional conduct for the New York State Bar Association. Passionate about providing clients with the highest quality services, Ms. Carreras collaborates with clients and consistently exceeds their expectations. Ms. Carreras spends her days attending trial proceedings, advising clients, interviewing witnesses and clients for litigation cases, and working with children, counselors, school officials and other attorneys for cases involving children’s law. She attributes her success to her energy and dedication.